This shrimp and kimchi stir fry couldn’t be an easier dinner to get on the table, marinate the shrimp for 10 minutes in gochujang, fish sauce, garlic and soy sauce. I love a good stir fry. But here’s the thing, I was always afraid of cooking over super high heat because I a) didn’t want to overcook anything and b) didn’t want to burn anything. In order to make a good stir fry, you really need to embrace high heat cooking. 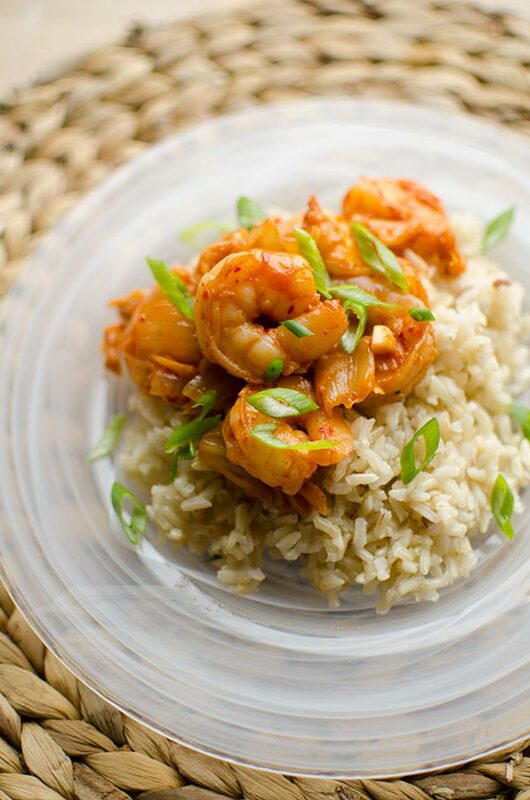 I like using fast cooking ingredients like shrimp because I know the chances of burning or overcooking it are slim. It’s also important to choose the right kind of oil for stir frying–don’t use an extra virgin olive oil or sesame oil here! What kind of oil should I use for a stir fry? Use an oil with a high smoke point to avoid it burning and ruining the flavours of a dish. Opt for safflower oil, peanut oil or vegetable/canola oil for stir frying. 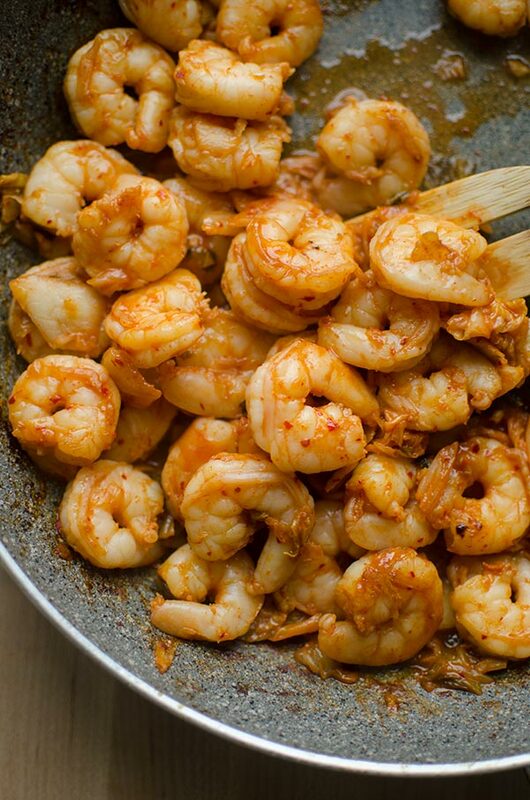 For this recipe, the shrimp gets a quick 15 minute marinade in a combination of gochujang (Korean chili paste), fish sauce, soy sauce and garlic. Fish only needs a short amount of time to marinate. The shrimp will cook in just two minutes in the hot pan. The key is to keep the shrimp moving at all times. The other secret to making a delicious stir fry is to not crowd the pan. It’s the same with sauteing ingredients–if you crowd the pan, your ingredients will end up steaming rather than stir frying, which is literally the opposite of what we want when we’re making a stir fry! Finally, with this cooking technique you need to keep everything moving in the pan. This will ensure it is evenly cooked and will stop any ingredients (in the case of this shrimp stir fry, we’re worried about the garlic) from burning. I was inspired to make this recipe because I realized that I didn’t really have a ton of stir fry recipes on here yet it is such a simple and flavourful way to cook! I have a classic peanut chicken stir fry which is more like a curry, and also a light vegetarian stir fry with asparagus and tofu. In this recipe, kimchi is where most of the flavour comes in this recipe, but the key to using kimchi in any recipe is that you don’t actually want to cook it. Instead, you add it right near the end to simply warm it and add the flavour to the dish. This shrimp and kimchi stir fry couldn't be an easier dinner to get on the table, marinate the shrimp for 10 minutes in gochujang, fish sauce, garlic and soy sauce. Combine garlic, soy sauce, gochujang and fish sauce in a medium bowl. Add shrimp, and marinate for 10 minutes. Heat large frying pan or wok over high heat. 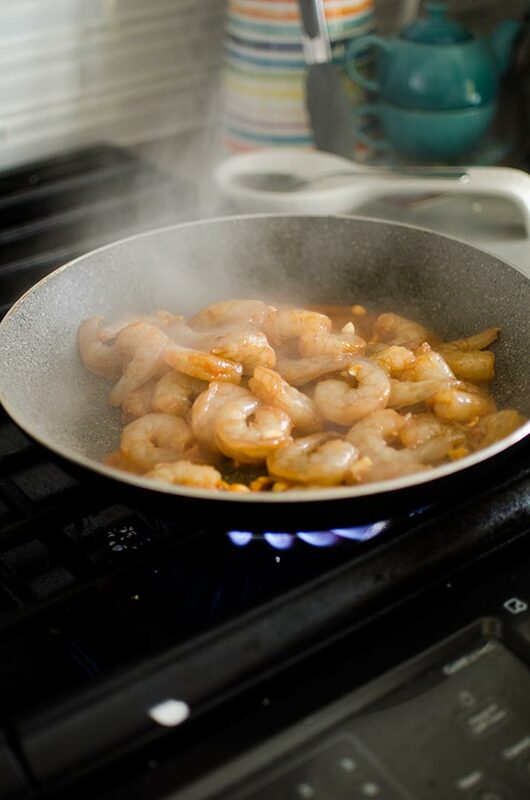 Add canola oil and shrimp, cook stirring shrimp constantly for two minutes until cooked. Add kimchi and cook another minute. Serve over brown rice with green onions. 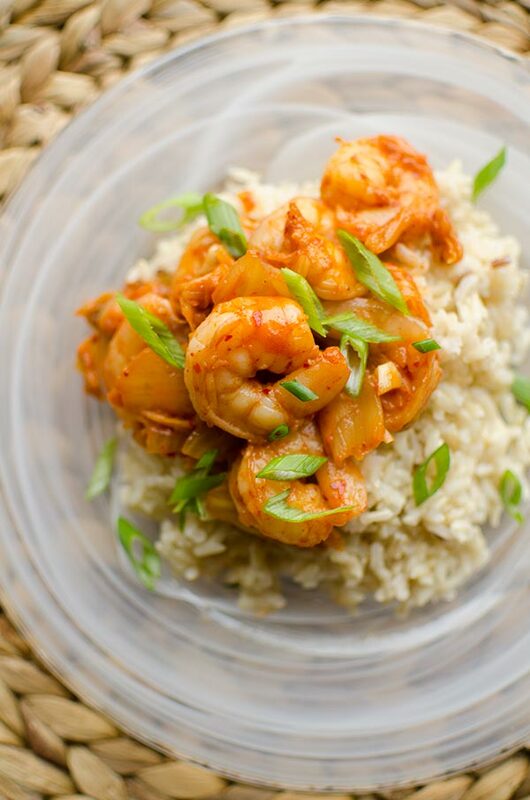 Let me know if you give this shrimp and kimchi stir frying a try in the comments below. I’ve made this dish twice now. It’s delicious and very fast and easy to put together. A real winner.